This handbook is a guide to using satellite telecommunication systems and is provided as an attachment to the Guide to the WMO Information System (WMO-No. 1061). It is intended for scientists and managers who are considering using satellite communications to collect data from remote instrumentation located either on land or at sea. The handbook aims to provide an overview of the state of the market at the time of writing (April 2018) so that users can quickly identify which satellite services are appropriate for their needs. Since the market is evolving rapidly, an online version will be made available via the WMO website (https:// wiswiki .wmo .int/ Satcom -Guide) and kept up to date as new systems are introduced to the market and older ones are retired. 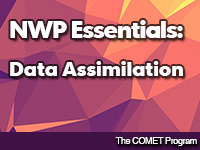 This lesson introduces the processes of model data assimilation. It also discusses the impacts of errors in the data assimilation on model forecasts and how a human forecaster can compensate for them. Several Meteorological service agencies have developed Extended Kalman Filter based land data assimilation systems that, in principle, can analyse any model land variable. Such systems can make use of a wide variety of observation types, such as screen level observations and satellite based estimates such as retrieved surface soil moisture and retrieved skin temperature. Indirect measurements can be used and information propagated from the surface into the deeper soil layers. A key component of the system is the calculation of the Jacobians of the observation operator which describe the link between the observations and the land surface model variables. The Jacobians are estimated using finite difference by performing short model forecasts with perturbed initial conditions. This report examines the Jacobians that link observations of screen level variables, satellite derived surface soil moisture and satellite derived skin temperature to model soil temperature and moisture. 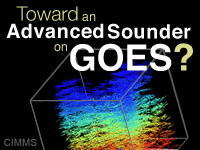 Toward an Advanced Sounder on GOES? 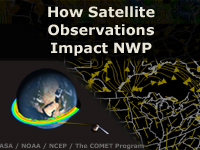 This module uses recorded interviews from several satellite meteorologists and respected satellite experts to describe how a high spectral resolution infrared sounder in geostationary orbit would lead to significant improvements in mesoscale and severe weather forecasting and numerical weather prediction. Discussions focus on the currently unsatisfied need for an advanced sounder in geostationary orbit and the potential contributions this capability could provide. Improving the combination of observations and dynamical models by data assimilation systems has underpinned many advances in our understanding of the natural environment, and forecasting ability. These improvements, coupled with the development of ever more powerful computers and more sophisticated communication systems such as the internet and the World Wide Web have also heightened expectations. As a result, society is looking for further significant benefits from applications of meteorology, oceanography and hydrology.